Summary: Never before has a date in history been so significant to so many cultures, so many religions, scientists, and governments. "2012" is an epic adventure about a global cataclysm that brings an end to the world and tells of the heroic struggle of the survivors. I think this looks interesting! I'm always worried about stuff like this, and we all have heard of the stories of what will happen in 2012, along with other stories! hehe! 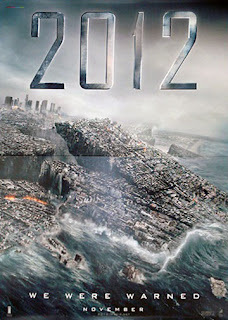 I wonder how many people will end up building bunkers and stockpiling food and weapons after this movie comes out...? This kind of stuff is like that Y2K crap back in 2000. I remember being a younger teenager during that and my neighbor buying bottled water upon bottled water. I really dont believe in this 'end of the world' stuff but hey, it is a very interesting subject. And this movie does look pretty good. Nice post! I think Jessica Andersen's books have a better 2012 prediction! !